Julie Dawkins Family: The Celebration!!! 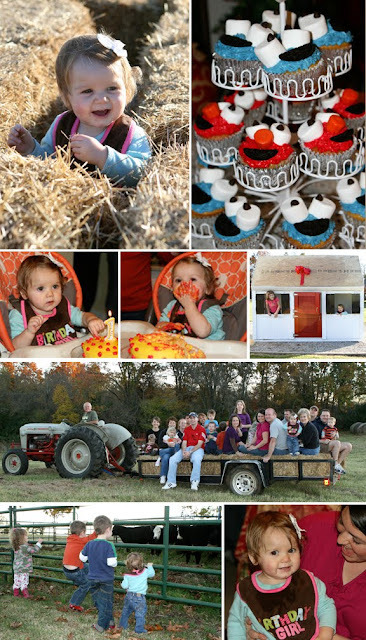 Hayride, Bonfire, Cousins, Cupcakes, Playhouse, S'mores, Friends, Glow Bracelets, and Cows! This little birthday girl's day was made! I decided to follow my own blog advise and make the Elmo & Cookie Monster Cupcakes; the only change I made was Elmo's nose. I used a candy corn pumpkin instead of a jelly bean. They were super easy to make! The playhouse; we did it! After all all the researching and dreaming; I can't believe we got it finished and it was the hit of the party! I'll show you more of how we did it in a later post. We have to disassemble it and move it to our house and put it back together so there will be a major post coming when that actually happens!